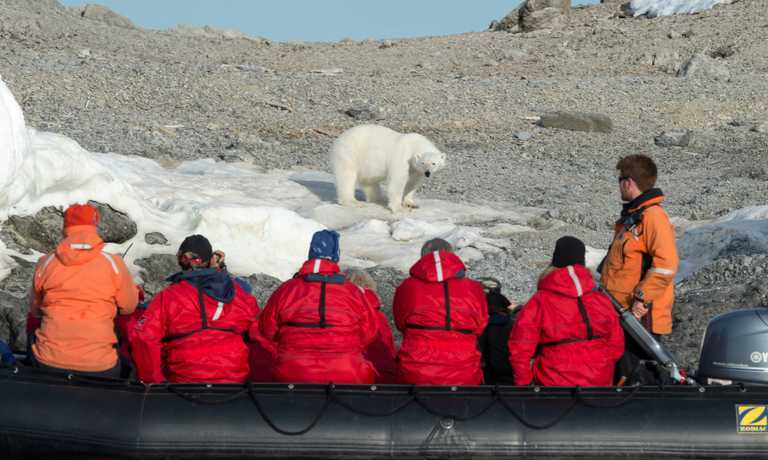 Travelling at the height of summer, what really sets this 13-day trip apart is its length - the longest of any Svalbard cruise - providing the best possible conditions for wildlife encounters. 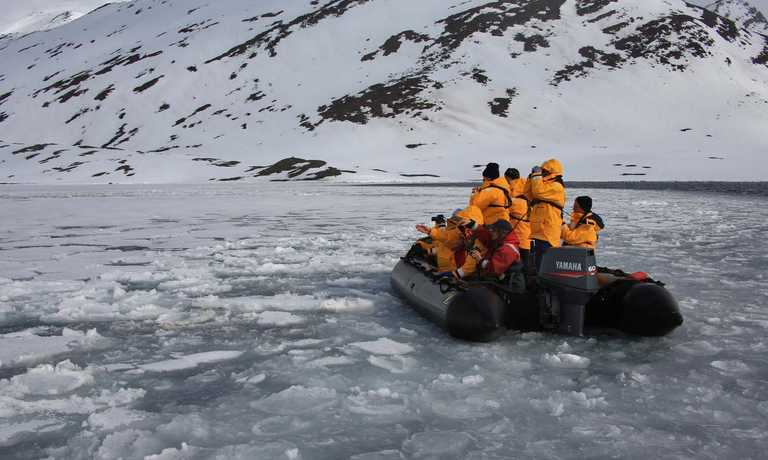 Perfect for wildlife enthusiasts and anyone keen to circumnavigate Spitsbergen. Optional kayaking. Your Spitsbergen arctic voyage begins when you board your ship in Longyearbyen, the island's largest settlement. Enjoy your first view of the island's rugged, glacier-topped mountains, rising majestically from icy waters. Expect a new adventure every day as we begin our circumnavigation by heading north and around the island of Spitsbergen, exploring smaller, outlying islands. The variety of incredible wildlife and geological formations found here is astounding. We plan to circumnavigate the island of Spitsbergen, but if conditions are favorable, we will also attempt a circumnavigation of the whole Svalbard archipelago. Every expedition will be different, depending on the weather and ice, but we do hope to visit a few of our favorite landing sites, including the 14th of July Glacier, Ny London, Phippsoya, Alkefjellet and the seldom-visited Kvitoya. The names may seem strange to you, but each has its own unique appeal. For birders, the 14th of July Glacier is home to purple sandpipers, common eiders, barnacle geese and arctic terns, while Alkefjellet is home to nesting Brunnich's guillemots (thick-billed murres). 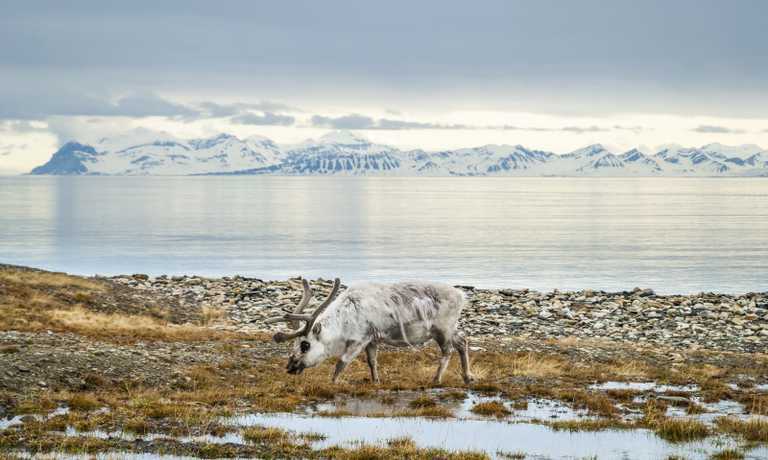 If you're looking for confirmation that reindeer are real, then you'll want to have your camera ready for visits to sites like Ny London, Sundneset and Alkhornet. As for the largest land carnivore in the world, searching for polar bears is a constant activity for our Expedition Team. Phippsoya and Isbukta are two of the bears' preferred places for hunting, which translates into great potential for you to capture them in action. A big part of appreciating Spitsbergen comes from understanding the culture - not just how people live today, but also how this land was first explored. Whaling was a key industry, and you will see old blubber ovens from the 16th century, plus other evidence of whaling at landing sites such as Smeerenburg. Colorful tundra meadows are complemented by glaciers, and sometimes there is a rare chance to spot beluga whales. Your adventure ends in the frontier-style settlement of Longyearbyen. From here, we'll transfer you to the airport for your flight home. At date of embarkation, the minimum age restriction of 8 years and a minimum height and weight requirement of 64 lbs or 29kg and 48" or 1.2 meters must be met.